There is something to be said about a handgun design that has stood the test of time virtually unchanged for almost a century. Such is John Browning's 1911 design of the single-action .45 caliber semi-automatic pistol. The 1911 pistol has since become the venerable icon for the modern combat handgun. The Colt Model 1911 served the united States Armed Forces for 75 years before it was eventually replaced by a NATO compliant 9mm pistol. But that by no means marked the end of the 1911 pistol. It has continued to maintain a strong popularity with law enforcement and private citizen alike. Because of its unceasing popularity, the 1911 design still continues to be produced by a variety of handgun manufacturers. Today most 1911 style handguns are high-quality, high-precision weapons desired for both their accuracy and reliability. But while quality materials and precision construction highlight most modern 1911 pistols, the actual design of the 1911 still remains virtually unchanged from John Browning's original model. 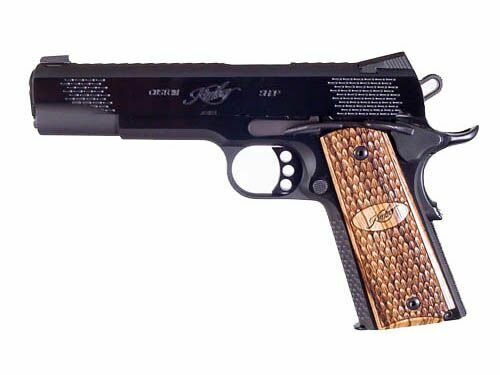 The list of companies making quality 1911's is long and includes the likes of Colt, Smith & Wesson, Ed Brown, Les Baer, Detonics, Kimber and Wilson Combat, to name a few. Recently a friend of mine presented me with a new Kimber Raptor II to review, and I thought it would be a good opportunity to see what's being done today with this longstanding classic design. What I discovered is that there are basically two classes of 1911 pistols produced today; a standard utility class that ranges in cost around $700 or less, and a match grade precision class that ranges in cost around $1000 or more. In the utility class you have companies such as Armscor, Auto-Ordnance, Norinco and RIA. Companies such as Colt, Para-Ordnance and Springfield Armory produce 1911 pistols in both utility and precision classes. Then there are companies that focus particularly on precision class 1911 pistols such as Smith & Wesson, Ed Brown, Les Baer, Detonics, Wilson Combat, and of course Kimber. Kimber has been producing precision quality and match grade 1911 pistols for the last 11 years. In 1997 Kimber consolidated its Clackamus, Oregon operations into its Yonkers, New York facilities, where it continues producing its quality weapons today. 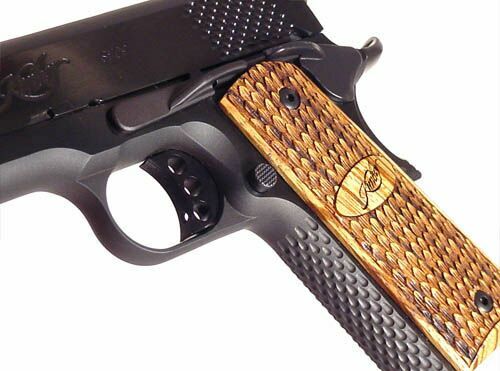 Kimber's Raptor II began production in 2004 and is particularly distinguished by its unique "scaled" serrations, its Zebra wood grip panels and fixed slant night sights. Highly polished black-anodized carbon steel frame and slide. 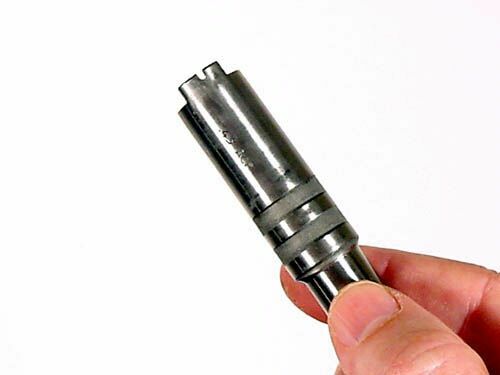 Stainless steel match grade barrel. So how do you distinguish one manufacture from another, or one model from another, when adherence to the original design is the benchmark? Well, I can think of several categories that can be used to make the distinction, such as, how well it's manufactured and the materials that are used, additional features and enhancements made to the original 1911 design, the pistol's style and looks, and finally its overall value. 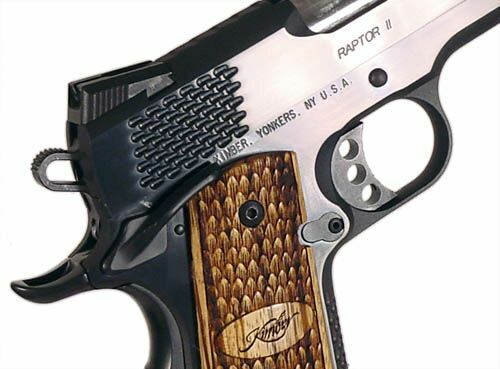 Except for their springs, every part of a Kimber pistol is manufactured in their Younkers, New York facility using high quality metals and alloys. Within that facility is Kimber's Custom Shop, which has two primary functions – modify Kimber pistols to meet specific needs of the owner, and build several special models for sale to Kimber Master Dealers. The Raptor II is one of those special models. Custom Shop models include features like an ambidextrous thumb safety, match grade premium aluminum trigger, stainless steel match grade barrel with polished match grade chamber, and special Custom Shop markings. Slides and frames are mated in the early stages of production and travel through the balance of construction together, ensuring optimum fitting of every part. 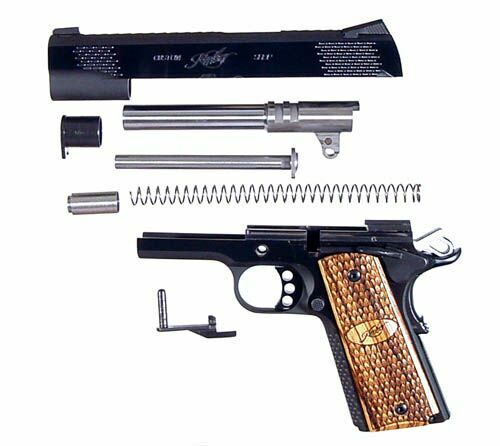 Some safety enhancements that were made to the original 1911 design include a full length recoil spring guide rod and a firing-pin safety mechanism. These enhancements are becoming "industry standard" additions to most quality 1911 pistols manufactured today. 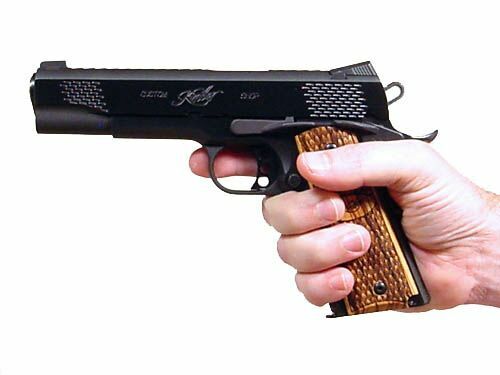 The "II" designation on the newer manufactured Kimber pistols indicates the inclusion of the firing-pin safety in the design. But, unlike other manufacturers that tie the firing-pin safety release to the trigger which may effect trigger-pull weight and smoothness, Kimber ties its firing-pin safety release to the existing grip safety lever instead. Another "industry-standard" enhancement is the Raptor's eight-round single-stack magazine. Other performance features specific to the Raptor II include low-profile tritium night sights and a flat-top slide with back-cut serrations to reduce glare. When it comes to style, the Raptor II is indeed unique. Standard grip strap cross-hatching and slide serrations have been replaced with reptilian scale-like tooling, giving to its prehistoric namesake. This reptilian theme continues with finely crafted scale-like engraving on the gun's walnut grips. You can tell when you have a finely crafted gun in your hand. The Kimber Raptor Ii is solid and tight. Not even the slightest rattle can be heard when it is shaken, even when it is fully loaded. The slide action is smooth and barrel lock-up to the battery is quick and tight. The single-action trigger has virtually no play. The only un-exceptional feature of the gun is the loaded chamber indicator. 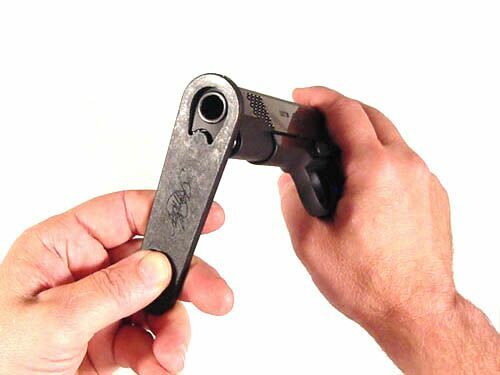 The little notch on the barrel's chamber hood barely serves the purpose, but it is probably the best anyone can do without dramatically altering the original 1911 design. The unique scale-like serrations are as functional as they are stylish. 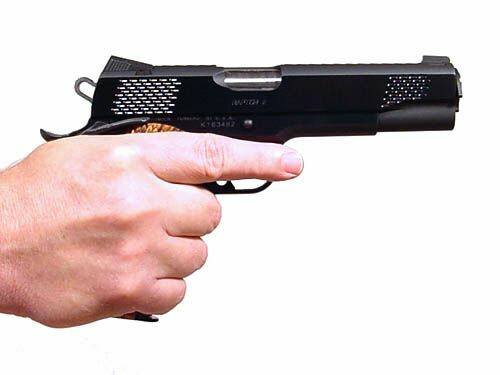 The gun sticks to the hand and does it comfortably. The slide racks with ease and the top serrations do a great job of eliminating reflection. When it comes to handling, this gun has no surprises. It is absolutely no different than the original 1911 design in both weight and shape. But also like its original design, it is well balanced and feels very stable in the hand. 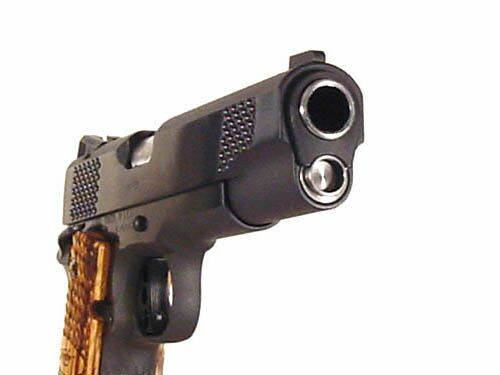 Because of the guns weight, felt recoil is is extremely small, particularly for a .45 caliber gun. This makes target re-acquisition between shots very quick, and lends to the gun's inherent accuracy. And, this gun is extremely accurate, and a pure joy to shoot. Although the night-sights do appear a bit dull in regular daylight, it is still very easy to find your target. Groupings were all consistently tight. One of many Kimber variations of Browning's 1911 .45 caliber semi-automatic pistol. Features shown here are the skeletonized hammer, extended tang, and front-and-rear slide grip serrations. A classic 1911 design with a unique reptilian scale style. The Raptor II broken down to its field serviceable components. Unlike many pistol designs, the 1911 frame completely encloses the pistol's action, keeping it particularly dirt and grime free. Only the gun's safety mechanisms protrude through the frame. The larger pin links to the sear, locking it until the slide has moved completely forward. The smaller pin is tied to the grip safety lever. 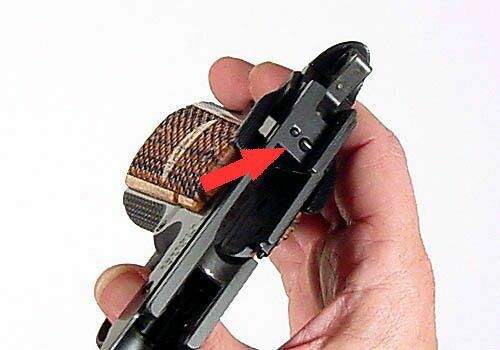 When the grip is squeezed this pin is pushed into the slide, releasing the firing pin safety. 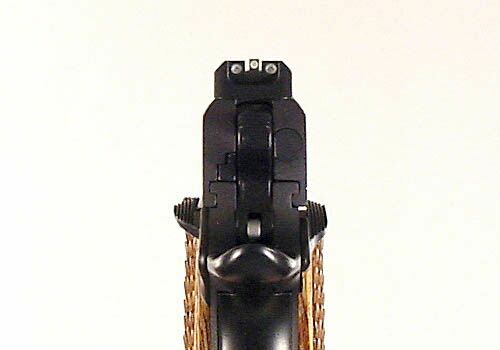 A small notch in the barrel's chamber hood allows you to check to see if the chamber is loaded, although trying to see brass through this small opening is difficult to impossible in low-light. The 3-dot tritium night sights work great in the dark, but they are a little dull in regular daylight. The full length recoil spring guide rod and firing-pin safety have become "industry-standard" safety enhancements added to Browning's original 1911 design. The recoil spring plug on the Raptor II has a hole cut in it to allow the full length guide rod to protrude through when the slide retracts. 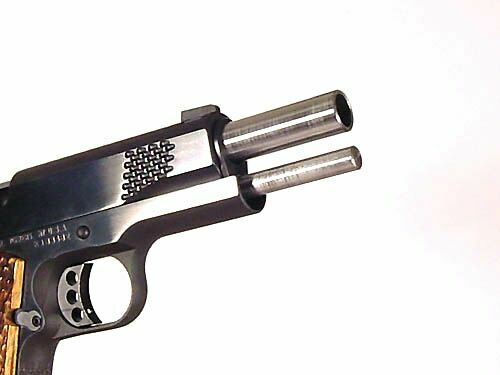 To disassemble a 1911 you must depress the guide spring plug in order to turn the barrel bushing. Since the guide spring plug on the Raptor II has been modified to allow the guide rod to pass through, it is difficult to depress the plug and turn the bushing without the supplied disassembly tool. The reptile scale theme continues from the slide and gripstraps onto the walnut grips. Here you can see the Raptor's skeletonized hammer and trigger as well as the ambidextrous thumb safety. 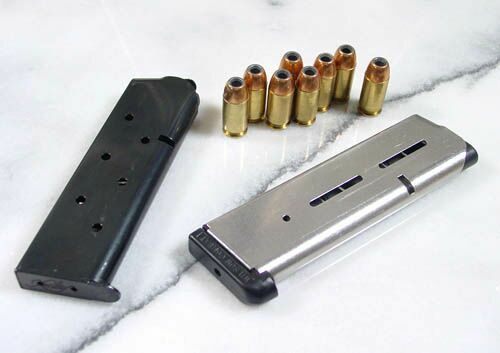 The Raptor II is supplied with standard welded single-stack 8-round magazines(L) but will easily accept performance magazines such as the Wilson Combat 47D magazine(R).